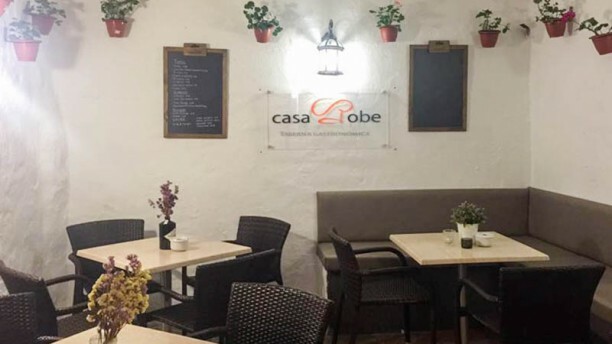 I was really impressed with Casa Robe. Our waiter was absolutely fantastic. He was enthusiastic about the food, the wine and the pairings. I unfortunately do not know his name, a gentleman with a beard, who was very charismatic, had great English and was really excellent. The dishes he recommended were spot on, flavoursome authentic Spanish and Andalusian dishes. We had a red wine for €15 from Ronda (served cold) which was exquisite and unbelievable value. I thoroughly recommended this quaint little restaurant for great food, atmosphere and excellent staff. Nice small restaurant far away from all touristic bad restaurants. Service with a BIG smile. Very friendly host. Great tapas.